The world of climbing won’t forget the 2019 Academy Awards ceremony. The movie Free Solo which profiles rock climber Alex Honnold, won the Academy Award for best documentary feature. Alex Honnold is noted for his stunning free solo ascents; basically solo climbs without using any ropes or climbing gear. All that he uses on these ascents from the litany of climbing paraphernalia are rock climbing shoes and climbing chalk, carried in a chalk bag. Free Solo covers Honnold’s 2017 solo ascent of El Capitan’s Freerider route. El Capitan is a vertical rock formation, roughly 3000 feet high, in Yosemite National Park, US. It is a much revered objective in the world of big wall climbing. The film is directed by Elizabeth Chai Vasarhelyi, a documentary filmmaker and Jimmy Chin, professional climber and skier who is also photographer for National Geographic. “ The film benefited from Honnold’s thoughtful charm on camera, and Chin and Vasarhelyi’s incredible access during Honnold’s years-long training process, including while he was thousands of feet off the ground without a rope,’’ Outside magazine observed in an article marking the Academy Award. The magazine described the movie as the first climbing film to receive such broad mainstream acclaim. 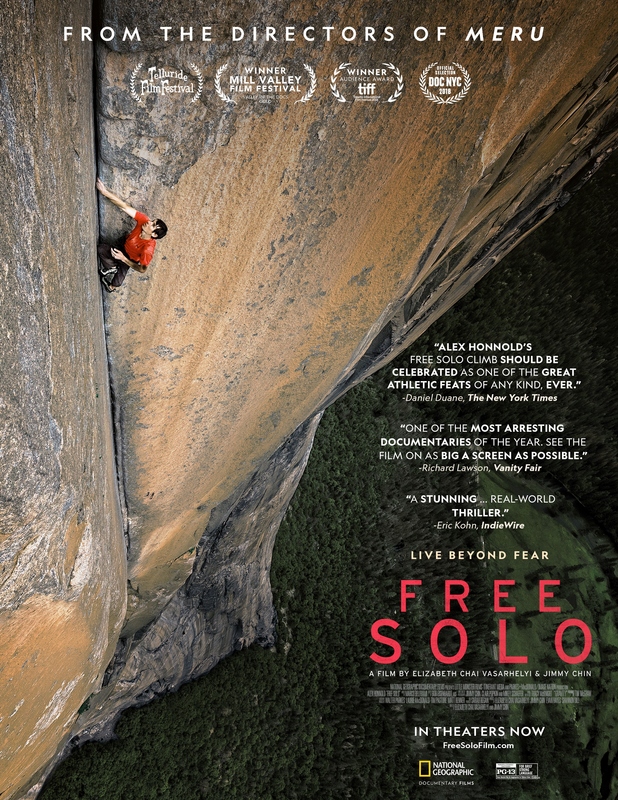 Free Solo was released in August-September 2018. According to Wikipedia, it has so far made 19.3 million dollars at the box office. The highest grossing documentary on IMDB is 2004’s Fahrenheit 9/11, directed by Michael Moore. It made 119.19 million dollars. This film poster was downloaded from the Internet and is being used here for representation purpose only. No copyright infringement intended. 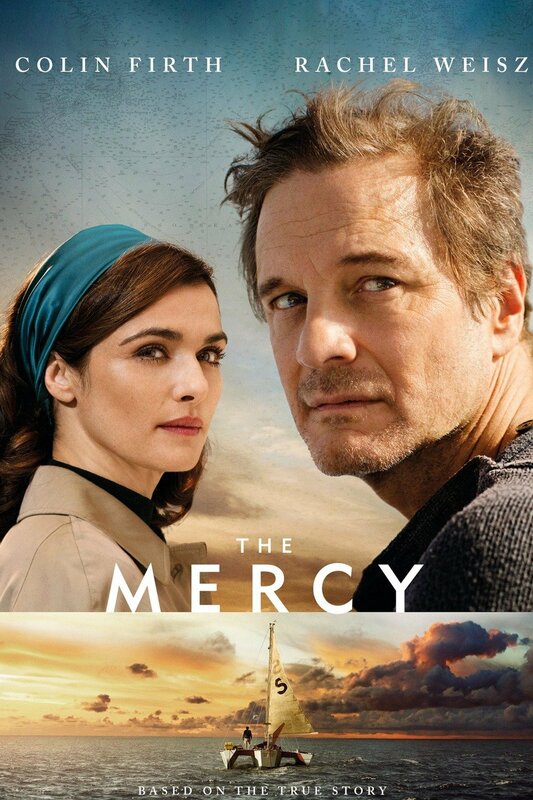 The Mercy is about a participant in the1968 Sunday Times Golden Globe Race, which produced the first solo nonstop circumnavigation of the planet in a sail boat. But it felt much more than a film on Donald Crowhurst. Besides the reality of single handed sailing, vastly different from life ashore, it was invitation to contemplate why we chase goals, how prepared we are for what we wish to accomplish and how apt the sponsorship models adopted for the same, are. The film is recommended viewing. Hurricane Gilbert of 1988 is one of the strongest Atlantic hurricanes on record. It was the most intense hurricane till it was surpassed by Hurricane Wilma in 2005. Gilbert wrought widespread havoc in the Caribbean and Gulf of Mexico; it killed 318 people, damage to property was estimated at $ 2.98 billion. The Cayman Islands, an autonomous British Overseas Territory in the western Caribbean Sea, was among regions affected by Hurricane Gilbert. Cayman Brac is part of Cayman Islands. In 1988, among other things, Gilbert damaged further an already damaged trimaran – 41 feet long and at that time, twenty years old – which lay neglected on the beach at Cayman Brac. Whenever the story of the 1968 Sunday Times Golden Globe Race (GGR) is told, the little known Teignmouth Electron is as crucial a player, as the Suhaili, which won the race essaying the world’s first solo, nonstop circumnavigation in a sail boat or the Joshua, which upon getting back to the Atlantic traded its chances of winning for another half voyage around the world. Teignmouth Electron was originally built for Donald Crowhurst, the only sailor who didn’t survive the 1968 GGR. He faked a whole voyage around the world, from the Atlantic and back to it, while all along remaining in the Atlantic. It would be easy to dismiss him as a fraud. Behind every act of fraudulence is a story and such stories typically point to circumstances as much as they do to person. The 1968 GGR is remembered in India because Suhaili – the sail boat in which, Sir Robin Knox-Johnston won the race – was built in Mumbai. Crowhurst was born 1932, in Ghaziabad. According to Wikipedia, following India’s independence, his family moved to England. Their retirement savings were invested in a sports goods factory in India. But the factory burnt down during the riots around India’s partition. Thanks to financial problems, Crowhurst was forced to leave school early and become an apprentice at the Royal Aircraft Establishment at Farnborough Airfield. He subsequently served in the air force and the army. Eventually he commenced a business called Electron Utilisation which had among its products, a radio direction finder useful at sea. His attempts to sell this product and related presence at an expo around boats and sailing where Sir Francis Chichester (the first man to circumnavigate solo along the clipper route and the fastest circumnavigation till then) discloses plans for the 1968 GGR, form the opening scene of the film, The Mercy. “ A man alone in a boat is more alone than any man alive,’’ Sir Francis’s character played by Simon McBurney says. Colin Firth’s Donald Crowhurst is in the audience, listening. A married man with wife and three children and a business struggling to stay afloat, he decides to participate in the 1968 GGR hoping to leverage his participation and the visibility it may bring, to rejuvenate his business. He builds a trimaran because it is capable of great speed. He also tweaks the design to accommodate one of his innovations meant to steady the boat should it capsize in rough weather. Stanley Best – played by Ken Stott – agrees to fund his participation in GGR; Rodney Hallworth – played by David Thewlis – comes aboard as press agent managing publicity. Until GGR, Crowhurst had only been a weekend sailor. What unfolds in the race is even more desperate than the challenges he faced attempting to succeed at his business. I first heard of Donald Crowhurst in 2013, while writing an article on Sagar Parikrama, the Indian Navy project that gave India its first solo circumnavigation in a sail boat (Captain Dilip Donde [retd]) and the first solo nonstop circumnavigation (Commander Abhilash Tomy KC; at the time of writing this article, out on his second solo nonstop circumnavigation as part of 2018 GGR). It was Captain Donde’s recommendation that I read the book, The Strange Last Voyage of Donald Crowhurst by Nicholas Tomalin and Ron Hall. Crammed with details from Crowhurst’s logbook, the book was not an easy read. Compared to it, The Mercy moves faster. However, books tell stories more comprehensively and you feel that about The Mercy, which introduces you to a Crowhurst willing to risk it all without giving you matching insight into what made his character so. Equally taken for granted or relegated to backdrop is the sea. If the sea and its nature played a part in weekend sailor-businessman becoming even more desperate miles away from shore, then that evolution is not adequately conveyed by the film. The isolation, loneliness and work to keep home upon water floating, don’t come through although the general sweep of Crowhurst’s story gets told. That’s the film’s strength. In particular I could sense the pressure caused by his expectations, the ill finished boat and the publicity accompanying sponsorship model. Into the voyage, fiction gradually replaces fact in Crowhurst’s progress reports. The 1968 GGR entailed circumnavigation starting in England and ending there. In era preceding GPS, Crowhurst’s periodic radio transmissions are all that family and support team in England have to go by. When Crowhurst’s fictitious report puts him near the Cape of Good Hope, Hallworth in his statements to media pegs him farther out to build a positive, adventurous image. The publicist’s enthusiasm isn’t agreeable with Crowhurst, who is banking on a finish in last place to spare him probing questions that may unravel his fraud. He goes into radio silence. Hallworth keeps the momentum going with invented reasons for radio silence and access for media to interview Mrs Crowhurst, which she dislikes. When Crowhurst commenced his sail around the planet, he was a weekend sailor in a newly built, untested boat with no assurance of winning the race, his business and house on land marked as collateral to sponsors underwriting the voyage. In the seven months that follow, his plight – combination of boat not up to the mark and his own limited experience as sailor – becomes clear. Instead of admitting failure, he starts to fake circumnavigation. 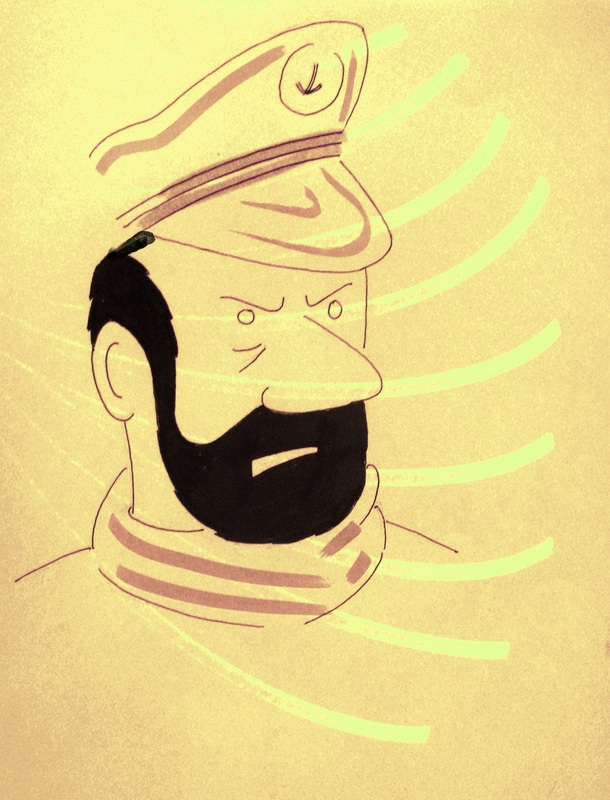 At one point, his fake radio transmissions have him sailing at record breaking speed. Eventually as the mix of cheating and loneliness gets to him he loses his mind. He hallucinates, becomes deeply reflective. “ The end must come to all human experience and that alone is certain,’’ he notes. In July 1969, the Teignmouth Electron was found abandoned in the Atlantic; there was no sign of its occupant. Crowhurst is believed to have committed suicide. A film on a circumnavigation that didn’t happen, The Mercy – I felt – found its clearest moments in dialogue. Towards the end of the movie, Rachel Weisz’s character, Clare Crowhurst, says the following and it should stay with us as reference point for our times, wherein few are content being themselves and there is imagery by money, media and marketing for use as currency to be larger than life. To the media gathered outside her house after news broke that her husband had possibly faked his voyage and was now missing at sea, Clare says: I don’t know if my husband slipped and fell or if he jumped as you are now saying. I would like you to rest assured that if he did jump, he was pushed and each and every one of you had a grubby hand to his back; every photographer, every sponsor, every reporter, every sad little man who stands at a news stand to feast on the scraps of another’s undoing. And once he was in the water, you all held him under with your judgement. Last week you were selling hope, now you are selling blame. Next week you will be selling something else. But tomorrow and every day after, my children will still need their father and I will still need my husband. I am afraid that doesn’t make a particularly good story – does it? But then I suppose the truth rarely does. In The Mercy Crowhurst is not entirely cheat. You see context and person. The 1968 GGR was won by Sir Robin Knox-Johnston. He donated the prize money he got to Crowhurst’s family. Both the Suhaili and the Joshua were at Les Sable-d’Olonne in France, when the 2018 GGR commenced in July. Following the 1968 GGR, Teignmouth Electron was auctioned off. It changed hands a couple of times before ending up on that beach at Cayman Brac. According to information on the Internet, it continues to be there. In addition to the damage it suffered, some of its parts have been stolen by vandals. A replica built for use while filming The Mercy, survives. The Mercy was released some months before the 2018 GGR. A second film on Crowhurst called Crowhurst – starring Justin Salinger in the title role – has also released to good reviews. I watched The Jungle Book for the first time in Bengaluru. A successful animation film with several re-releases to its credit, I saw the movie in the early 1980s. It was screened at Rex Theatre on Brigade Road. I recalled this ahead of watching the film’s 2016 version at Mumbai’s Sterling Theatre, replete with 3D animation and contemporary movie stars providing voice to the characters. Further, keeping aside Jason Scott Lee’s Mowgli from the 1994 version, the main protagonist of Rudyard Kipling’s book was a human being on screen and not an animated character. While some people have said that the old 2D animated version is their preferred benchmark, things have changed for me – I embrace Jon Favreau’s creation as benchmark in my times with one difference: I thought Baloo’s song (The Bare Necessities) was more enjoyable in the earlier film. Maybe it’s because I was a lot younger then, less cynical, less critical and more spontaneous. Years later, as life took its twists and turns, among them bringing me to the outdoors and the mountains – I have often wondered: if not the bare necessities, what is it that I am seeking? One knew that after Richard Parker, the tiger in Life of Pi, Shere Khan would be convincing despite animation. What one did not anticipate was Idris Elba. 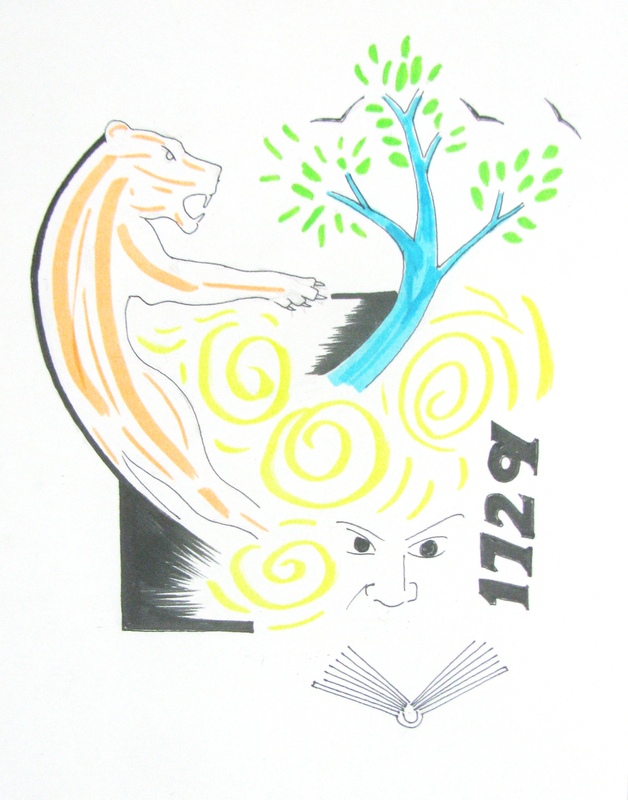 His Shere Khan remains for me, a force haunting Kipling’s jungle. From the menace Elba creates, flows the dark, ominous mood of the film, a trait that sets it apart from the more child friendly approach of the earlier version. But then, today’s child growing up with smartphone, is also arguably a more media immersed junior, for whom the earlier film may at best be fodder for a submission in class on how technology evolved. Of the people who voiced the characters in the earlier movie, only George Sanders was known to us at that time. In days preceding the Internet, old film magazines brought home Hollywood and Sanders was there in some of the issues I used to thumb through. Even then, a few of the voice actors in The Jungle Book, including Sanders, were no more by the time the curtain raised that evening at Rex Theatre. In the 2016 version, I could appreciate the main voices for these were actors of my time. I could also appreciate what seemed to me paradoxical choices that clicked beautifully. Thus for instance, Ben Kingsley’s voice – even and measured in how it registers aurally, seemed apt choice for Bagheera. Christopher Walken as King Loius – I wasn’t sure. Till I experienced it and felt the psychopath sort of terror – so not Shere Khan like – that Walken’s laidback, negotiator of a voice can bring. Bill Murray as Baloo was a breeze. What didn’t convince was Kaa, the python. It had one mesmerizing scene all to itself and then, was gone. Above all, this will be for me a Neel Sethi movie. 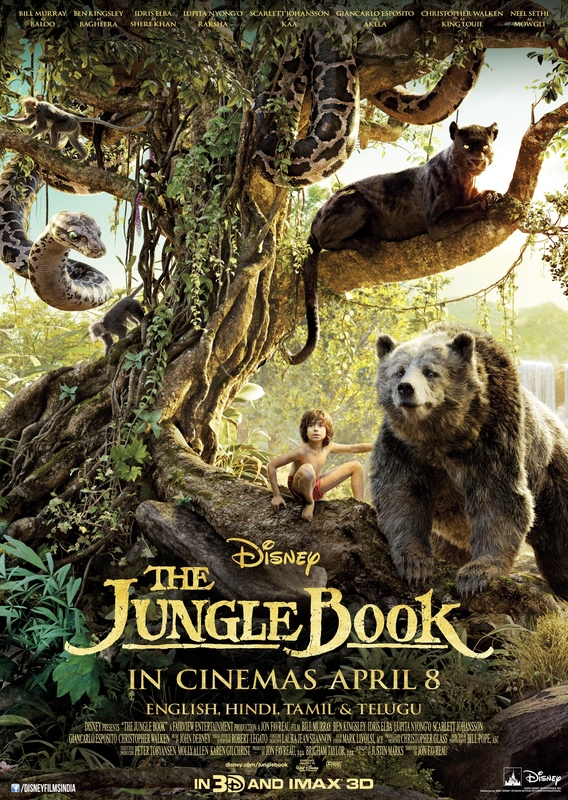 After seeing the earlier version, I was left with memories of Bagheera, Shere Khan and Baloo. With the 2016 version, Mowgli joins that list. Sethi does not essay his role harking of innocence. He brings an element of smart contemporary youngster to the frame, creating in the process, a bridge between city and jungle. I suspect, for a generation experiencing The Jungle Book in the age of reading’s progressive decline and walking as they do through its plot with Sethi’s Mowgli for company, Favreau and Disney may have replaced Kipling as creator of the story. In the business of making an impression, that is a measure of how effective you were. In the latter half of the 1980s, I saw a remarkable film at a film festival in Thiruvananthapuram. I went to see The Mission because of Robert De Niro but came off knowing the talents of Roland Joffe and Jeremy Irons as well. For me, Irons is among the great classically trained British actors of his generation; the sort with commanding screen-presence. Indeed in his case, that presence literally lurks in the frame waiting to explode. 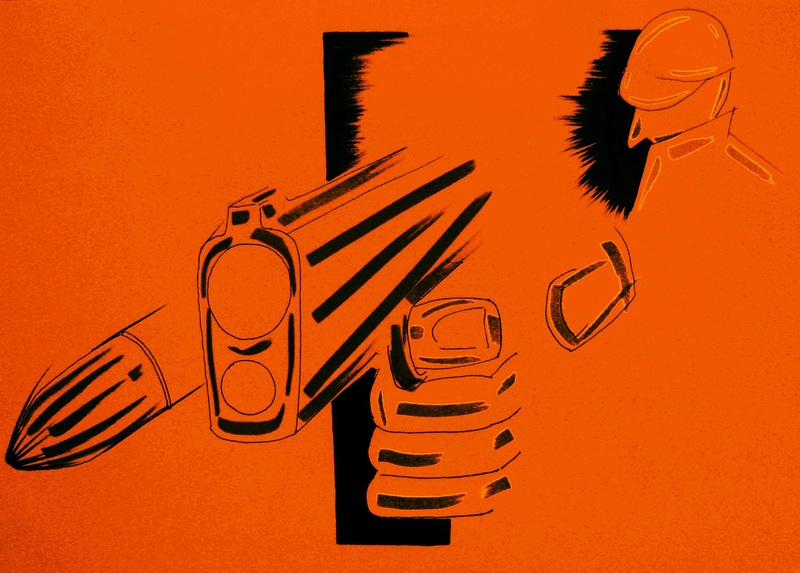 A few things define the Irons of cinema – an apparent discipline, intensity and voice. It is hard to have him in a supporting role and not lose the film to him. But if you are a film buff, you don’t mind that for losing a film to an actor of Irons’ calibre is rarely a bad experience. That’s what happened with Race; that’s what happened with The Man Who Knew Infinity. In the latter, it also helped flesh out and establish the respective characters of G.H. 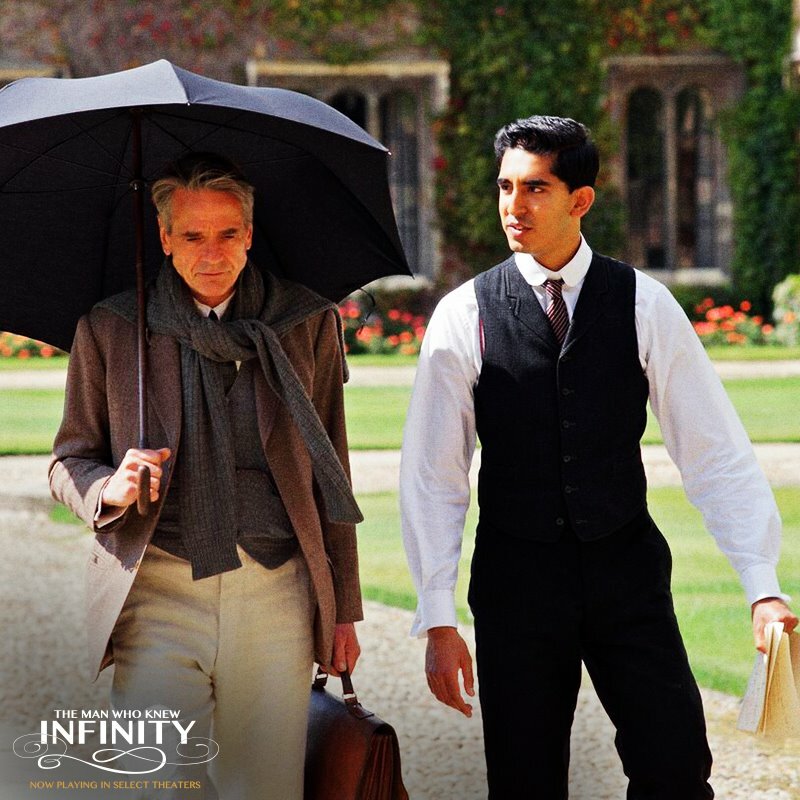 Hardy (played by Irons) and S. Ramanujan (played by Dev Patel), not just for the individuals they were but also the backdrops shaping them. I do not know much about Ramanujan beyond what I gleaned of him from the film. In the movie, he comes across as gifted in an almost mystic way; his mathematics by intuition versus Hardy’s math by proof, his tendency to spontaneously get started on equations and that dialogue – that his goddess, Namagiri, puts numbers on his tongue. There is always a bit of struggle in how the visual arts and directors, actors therein, portray genius. A similar struggle exists in The Man Who Knew Infinity and Ramanujan occasionally felt contrived. At times the mathematician’s earnestness, isolation and genius seemed tad overboard in the portrayal. But then like I said, I don’t know how Ramanujan behaved in real life. Those who researched know best. Wikipedia describes Ramanujan as an autodidact, a person who is self-taught. A lacuna to my mind, in the film, was the dearth of material on how Ramanujan reached the level of proficiency in mathematics he had by the time he wished to publish. That proficiency may have drawn much from things deeply experiential, like the relationship between self and ecosystem with math embedded in its living traditions. Equally, in conservative society with life and lifestyle rigidly defined, the abstract world of numbers may become a liberating private refuge. All this went unexplored in the film, which starts with the adult Ramanujan finding a mentor in his boss, Narayana Iyer. Matthew Brown’s movie was more about the Hardy-Ramanujan-Cambridge equation. Not for a minute am I saying that the Cambridge chapter is unimportant or uninteresting. The characters in that chapter have been presented well; the ambiance created by Hardy, J. E. Littlewood and Bertrand Russell is wonderful. Had it not been for them, we won’t have Ramanujan the way he is known today. Still, Cambridge is where the man was vindicated; he was formed elsewhere. 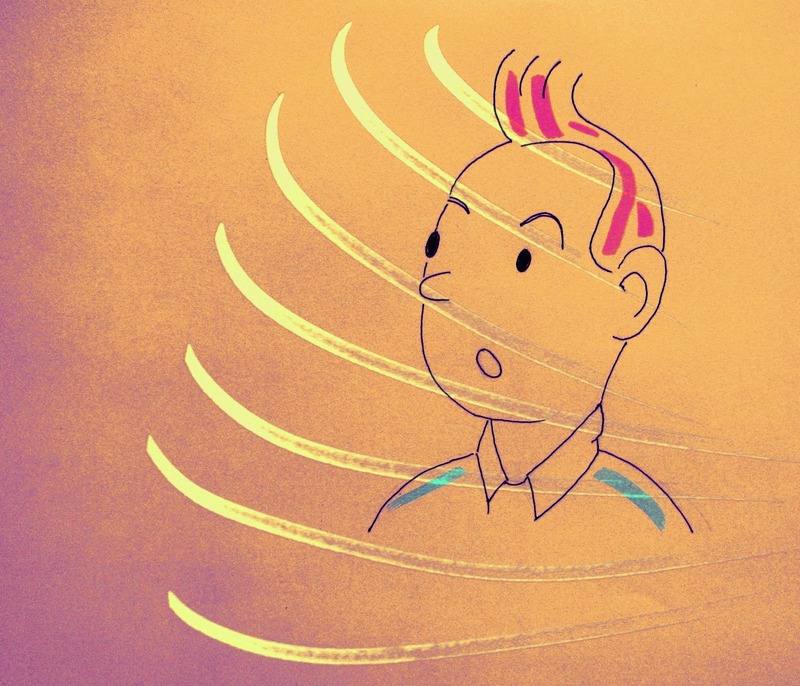 Can a story of genius vindicated be complete if the formation of genius is not explored? This film deserves to be seen. Reports said that the movie was a challenge to make because funding was hard to come by. It is a good effort and as usual, Irons is a class act. On the poster of `Race,’ actor Stephen James looks you straight in the eye. A front shot of the signature Jesse Owens pose, it is an expression of absolute focus; the edge of his palm in line with his nose, splitting his face and creased forehead into two halves. 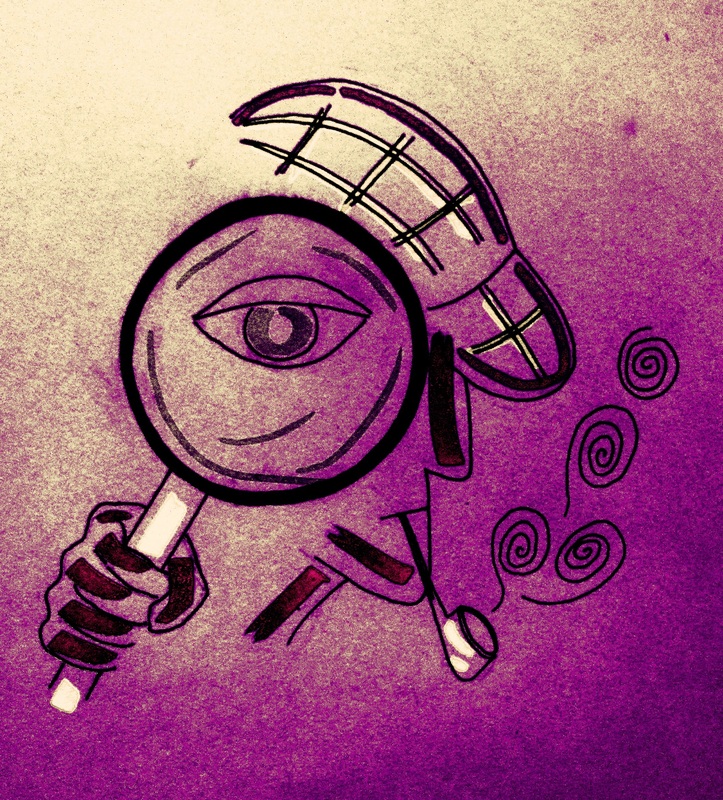 Each half is defined by a raised eyebrow with an eye below preying on a distant object – a finish line. The palm, the creased forehead, the eyebrows, the eyes – they emphasise his concentration to the expense of all else. What that poster conveys is the strength of Stephen Hopkins’s film. It tells an uncluttered, linear story that is almost a documentary on Jesse Owens. Denied melodrama, the film lets sport and its main protagonist, be noticed. Despite the light physical build of the classical athlete, his position in script is secure. The casting is balanced. The acting is right sized; a powerful actor like Jeremy Irons shines in his role but doesn’t squeeze others out. Amid the simmering race relations in the US of that time, the racist views of the Nazis and the growing danger in Nazism, sport shines through. There is the relation between Coach Larry Snyder and Owens. But I remember more other instances. 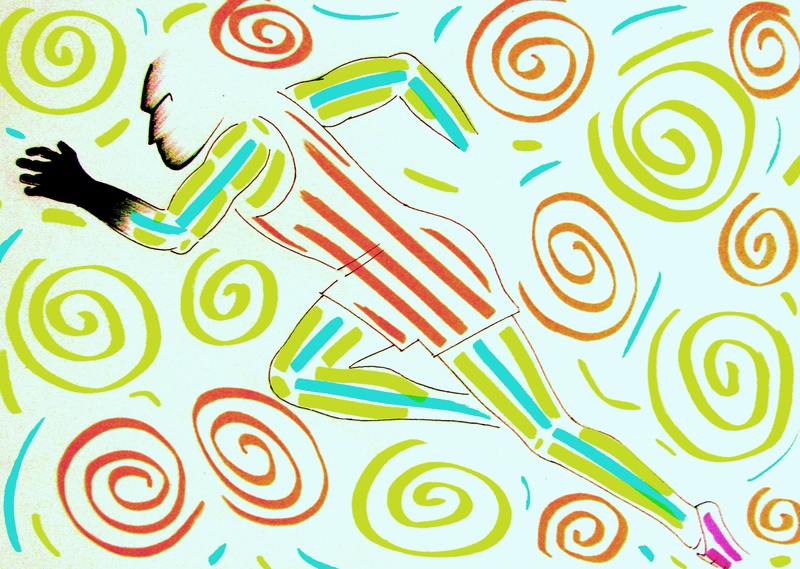 There is a dialogue in the film, one that speaks the perspective of sport: when you are running there is no black and white; there is only fast and slow. In age of propaganda, we see the equation between Joseph Goebbels and filmmaker Leni Reifenstahl. When Goebbels uses a construction project to bait builder and sports official Avery Brundage, in Berlin to evaluate whether American participation is possible in a Nazi run-Olympics, we see the colour of money (a 1999 article on the Berlin Olympics, in The New York Times, mentions a 1938 letter from Germany in the University of Illinois archives, indicating acceptance of the bid by Brundage’s construction firm to help build the German Embassy in Washington). There is the amazement America’s black athletes have in discovering no separate quarters for them at Berlin’s Olympic village. Then there is that conversation between Owens and Carl “ Luz’’ Long, the German long jumper Owens beat to second position. Long reveals his disapproval of racism under the autocratic Nazis and his belief that the democratic US system is better causing Owens to say reflectively that he isn’t sure. The scene sums up the predicament of individual in collective, then and now. Race is a good film. See it. However, a linear narrative denies as much as it shows. Owens is an athlete at times of racial discrimination in the US. Across the Atlantic, Germany consumed by notions of racial supremacy, views the 1936 Olympic Games awarded to Berlin, as an opportunity to showcase country under Hitler. America contemplates boycotting the Berlin Olympics to display its aversion for the Nazis’ racist policies and anti-Semitism even as transport buses on its own roads kept separate seats for African American people. Amid this, in 1933 and 1935 (as per the Internet) , Owens equals the world record in the 100 yard dash, becoming one of the top sprinters on the planet. Whether he should participate in the Olympics or not – easily answered in his athlete’s mind – becomes a vexing question for the African-American community. He is confused. It is a web of charged histories with athlete entangled. The film doesn’t delve deep into these trends shaping Owens’s times, even his life. Although eventual outcome is a film I found more watchable than what Bollywood served up on India’s best known sprinter, it must be said that in as much as the Indian film traded sport for the muscular nationalism loved by prevailing market, Hollywood embraced sport and breezed over history, including personal history. You suspect a more creative script may have accommodated those times better. I wouldn’t mind it even if the resultant film was called `1936.’ As sport becomes event management and event becomes the hunting ground of those seeking power, sport isn’t sure anymore what happened to it. That perennial question of individual in collective isn’t just a social, political or business question; it is a question in sport too, a question of what you lose in sport when you want sport on grand scale or want sport to prove a point. Race ends showing Owens and his wife taking the freight elevator to attend a reception in his honour because coloured people aren’t allowed entry via the hotel’s main entrance. This is in the US, soon after he won four gold medals at the Berlin Olympics. There is no hint, except as epilogue in text, of what followed. Owens returned to America from Berlin with no congratulatory message from the President of his own country. His sporting career ended early. Wanting to capitalize on his post-Berlin fame, he took up some commercial offers as a consequence of which, officials withdrew his `amateur’ status. Denied participation in amateur events and unable to sustain his reputation, his commercial offers dried up. This forced him to run for spectacle, including racing against horses. He ran a dry cleaning business and even worked as a gas station attendant. He eventually filed for bankruptcy. In 1966 he was prosecuted for tax evasion. It was after this, that recognition and help came. When you read this on Wikipedia, you realize how important it is for a biographical film to pick up those portions of a person’s life, which tell as much of his story as possible. In Owens case it is tough to do so for he packed much into his life, not to mention, his times was equally packed with social issues and political developments. How do you make a script of it all? Problem is – the moment one heard of a film on Owens, one thought of `Ray.’ The film on the singer-musician progressively built his character. You understood from where each brick came. The Owens of Race appeared parachuted into the movie, inhabiting it for a while and then disappearing with a scene, which is the last in the film but we know is the beginning of a tough phase for the athlete. If a man’s life is a reel of film, then Race with its linear narrative, has snipped and showcased the middle. For many years, I worked in South Mumbai, close to Churchgate. Sometimes too much typing on the computer got to me and I would step out of the newspaper office for diversion. 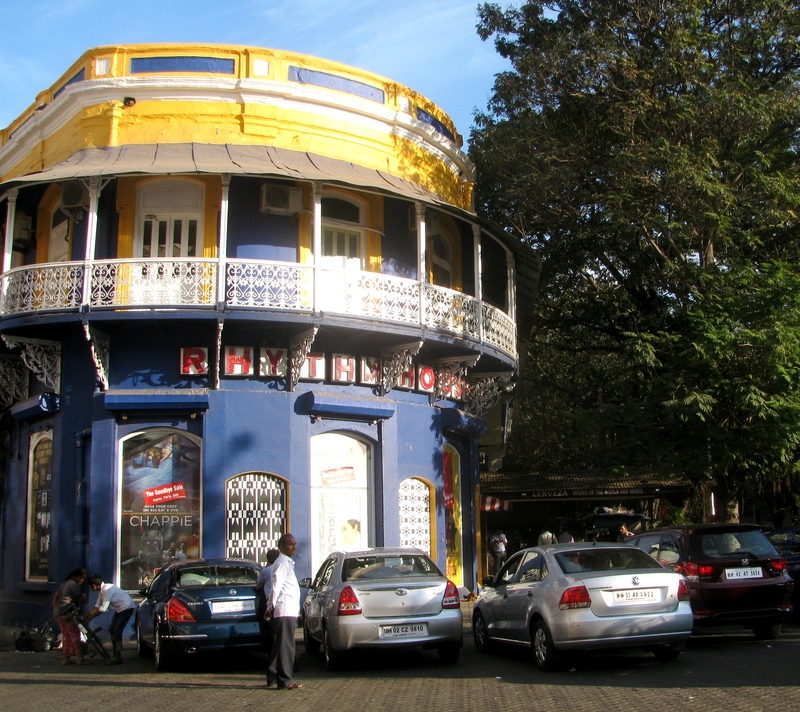 If I cut across the nearby Oval Maidan and its myriad cricket matches, then fifteen minutes walk away, was Rhythm House. It was a shop in an old building at Kala Ghoda, now the city’s art district thanks to the adjacent Jehangir Art Gallery, the pavement artists, the surrounding heritage architecture and an annual festival in the area with roads closed to traffic and open to arts and crafts. Compared to other shops selling music that arrived and closed during its time, Rhythm House was small. But it was packed with music and movie titles in the physical format. What you couldn’t find on the shelves, you ordered at the desk. I would spend some time here browsing through the collection, clear my head and return to work. One day, I wrote about Rhythm House. The new century had arrived. Businesses overseas had witnessed massive change through Internet and digitization. The world of book shops for instance, was besieged by question marks. As book shops struggled, I wondered what was happening at Rhythm House. Hence that old story written and published in the newspaper I worked for. It failed to capture well the shop and its predicament. Maybe I hadn’t known Rhythm House long enough to tell a story. I acted in haste. But I remember the owners being concerned of what lay ahead in the fast changing market. Still, if there was anything challenging Rhythm House, it wasn’t visibly alarming for the shop was well stocked and it had customers. During festive season, the traffic built up. Besides, sales or no sales, everyone knew Rhythm House. It was a Mumbai institution. At Rhythm House you met connoisseurs of music. Once in a while as I hung around the racks hosting music relevant to me, I would hear a customer or two ask the salesmen about specific albums or concert recordings. The salesmen would in turn indulge them in talk about the elusive recently sourced or, which can be sourced. The minor details bringing joy to collectors of music are fascinating. It is portrait by passion. You don’t sense these folks as palpably in cyberspace even though the digital side of everything is marketed as bigger meeting place. In the real world and its shops, you meet people in full and a person in full is person believable. I wrote that article on Rhythm House well over ten years ago. I subsequently became freelance journalist and in my less moneyed avatar, continued to visit Rhythm House but rarely purchased. I found relief just being there amid the music and films although I must admit, not being able to afford was progressively becoming a dampener. January 1, 2016. Having decided that a multiplex ticket costing Rs 400-500 to see the latest Star Wars movie wasn’t worth the strain on one’s purse, my friend Latha and I decided to go for a walk instead. Decades ago, I had watched the first Star Wars movie at a theatre in Thiruvananthapuram and returned home a fan of Han Solo. I watched the first trilogy. Then I watched Harrison Ford in all those Indiana Jones movies. Those days you could afford visiting the theatre. Now the question isn’t whether you are interested in cinema but whether you can afford multiplexes. I was a fan of Star Wars quitting at a choke point in the system called costly multiplexes. Our evening walk brought us to Kala Ghoda and the Jehangir Art Gallery, which we wished to visit. I think when you age you realize you are a traveller in the universe and therefore entitled to perspective. You find it in art, that’s why the occasional visit to the art gallery engages. As we left the art gallery, we noticed Rhythm House, distinctly less celebratory in appearance despite the festive season. When we drew closer, we saw the red board on its door: Goodbye Sale. I was shocked. Powered by discounts, the innards of the shop had been cleared out in parts. Latha picked up a rare recording of a Hindustani classical vocalist. Bill paid we got out but couldn’t leave. An institution was shutting down. We had no proper camera. So in the dim light, Latha took a photograph of the shop on her cell phone. Unknown to me, Rhythm House’s closure had been in the media since November 2015. The articles featured musicians, music lovers, music critics, authors and other residents of the city who shared their memories of the iconic establishment. A visit to the shop’s website showed a message. Excerpts: We are the last of our city’s large format music & video stores to yield to the challenges posed by new technologies and piracy. We are set to close for business end of February 2016. We have been in the music business since 1948 and in the video business over the past 30 years or so and closing down is therefore going to be an emotional wrench for us. Many of you have echoed similar sentiments and we thank you for being with us at this difficult time. I returned the next day to click the photos accompanying this story. 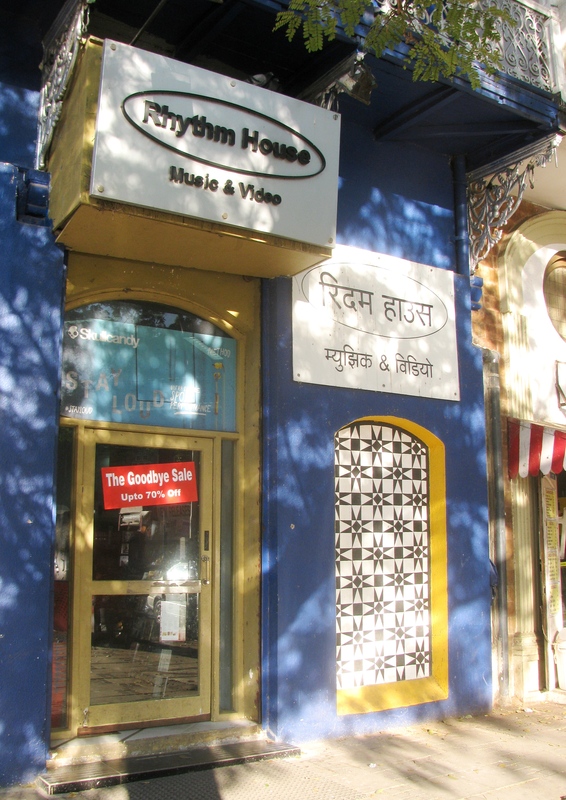 Mumbai’s art district and its music scene won’t be the same without Rhythm House.